There's Still Time to Sign Up For the Barbados National Team ~ The Bucky Channel - The World of Sports from Wisconsin's Perspective. Are you Barbadian by birth, nationality, or descent? Let us check it out for you. Do you play football professionally? 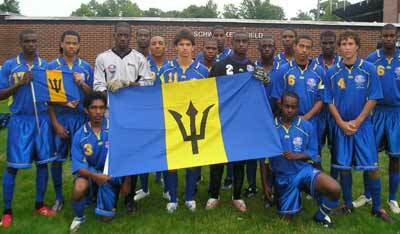 Would you like to become a member of Barbados' National Football Programme? If so, you may be in luck, as that is the actual message the club has on the front of their homepage. Apparently, they are open to seniors, youth, and even women. All you have to do is send them at not at bdosfootball@caribsurf.com, or ronalddac@yahoo.com. If you're interested, you better hurry up because they take on the United States National Team today at 4pm (ESPN2). It's part of a home-and-home series, so if you don't hear back by today there is always a chance to play in their next game. The loser of the two games is out of World Cup Qualifying for 2010 in South Africa, and the winner advances to group play. The United States needs to win this game by at least 4-0 today or it will be an embarrassment.